Bob Penfield is convinced his life has been charmed: during his 42 years with Disneyland, he always seemed to find himself in exactly the right place at exactly the right time. “The Last Original Disneylander” shares his journey, and the story of the world famous theme park he grew up with. Similar to Walt Disney’s humble beginnings, Bob was raised in a small Midwestern town, then headed for the sunshine and opportunity out West. Blessed with an insatiable curiosity, days after graduating from Anaheim High School, he went looking for summer work at the strange new amusement park being built down the road. He lucked into a job days before it opened, starting in July of 1955 as a ride operator on Disneyland’s Carrousel. Three days later, he was named foreman of the Snow White ride and, as soon as he turned 21, was promoted to management. He later transferred into the Facilities Division, where he got the opportunity to explore and examine every square inch of the park. Along the way, he also enjoyed side trips to help open Walt Disney World, Tokyo Disneyland, the Squaw Valley Winter Olympics, and the New York World’s Fair. He retired in July of 1997, as the last of the original employees. 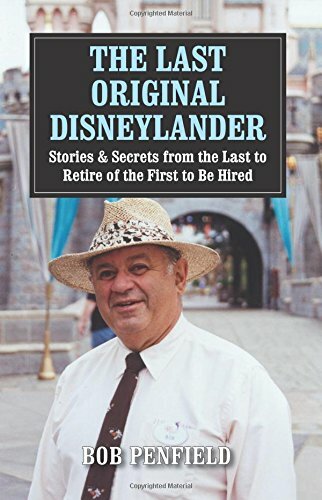 His intimate knowledge of the park, its history, and its amazing cast of characters provides a unique, up-close look at the creation and operation of the world’s most beloved vacation destination. Robert Dale Penfield started at Disneyland before it opened in July of 1955, serving as a ride operator on Opening Day before being promoted to supervision. He later moved to Custodial and then Maintenance Services, rising to superintendent of Area Supervision. In 1988 he was named long range program coordinator and ended his career in Construction Services, retiring in July of 1997 as the park’s final original cast member. Nonetheless, he continues to be actively involved with Disney, regularly participating in promotional events for the Company, organizing a monthly breakfast club for retirees, and serving as “keeper of the flame” for “Club 55,” the group comprised of fellow longtime cast members who started in 1955. Today, much of his efforts go into promoting the Walt Disney Birthplace Museum in Marceline, Missouri.